Find out why several of your guildmates are causing trouble in Leyawiin. Receive the quest details from Modryn Oreyn and travel to Leyawiin. Speak with the guildmates and the barkeep at Five Claws Lodge and learn of their frustrations. Talk to Margarte regarding contracts. Collect Ectoplasm to convince Margarte of the Fighters Guild's reliability. Update the guild members on the latest developments. After completing Unfinished Business, Modryn Oreyn gives you your next duty. You are required to stop some of your fellow guildmates (Rellian, Vantus Prelius, and Dubok gro-Shagk) from causing problems in Leyawiin. Head to Leyawiin and ask around about the rebellious guildmates (the guards are often pretty knowledgeable). It doesn't take too long to find all three of them in Five Claws Lodge. Speak to Rellian or Dubok. Both deny causing any trouble, blame things on the Blackwood Company, and direct you to Vantus. Vantus is angry because the Blackwood Company has been stealing all the jobs from the Fighters Guild and suggests that he and his fellow guild members just need work to keep them busy. Speak to Witseidutsei the barkeep, who wants the trio out of the place. Ask her if there are any employment prospects in the area and she'll suggest speaking to Margarte (a minimum disposition is required). Some other citizens may also point you to Margarte. Margarte's House is just southeast of the Five Claws Lodge. If she's not there, she is likely to be just outside the city collecting ingredients. She mentions that she is a trade consultant in addition to a mercantile trainer, but her true passion lies in alchemy... if only she had more time to collect ingredients. Ask her about Fighters Guild Jobs and she'll offer that she could use some Ogre Teeth and Minotaur Horns. She isn't sure whether to give the job to the Fighters Guild or to the Blackwood Company and suggests that if you were to find five Ectoplasms, the deal would be sealed in your faction's favor. Ectoplasm can be found on any type of ethereal undead, which includes all ghosts and wraiths. Once you find five Ectoplasm samples, return to Margarte and she will promise to make the Fighters Guild her sole supplier for Ogre Teeth and Minotaur Horns. Coincidentally, five leveled ethereal undead reside in the undercroft of the nearby Great Chapel of Zenithar. There is a silver longsword on the top floor of the Leyawiin Fighters Guild if you need a silver weapon to damage the ghosts. Return to the three Guildmates in the Five Claws Lodge in Leyawiin, who seem happy to finally have some work. Once the quest is completed, you will find Vantus and his men outside Undertow Cavern. Return to Modryn Oreyn in Chorrol for your standard level-dependent gold reward, one Fame point, and advancement to Swordsman. Modryn will have no further tasks for you at this time and directs you to Azzan in Anvil and Burz gro-Khash in Cheydinhal. After you have collected the ectoplasm for Margarte, she will subsequently buy Minotaur Horns and Ogre's Teeth from you, though at terrible rates. See Margarte's page for details. The journal entries (see below) show the original design of this quest. In the released game, the Fighters are merely belligerent rather than violent, but your journal will still contain the incorrect note about needing to subdue them. Maglir in Skingrad can also point you in the direction of the Five Claws Lodge in Leyawiin, even though he himself has nothing to do with the quest. 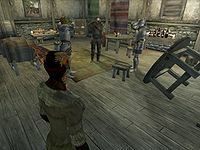 A player is able to sit on the overturned stools in the Five Claws Lodge, causing their character to appear suspended in midair. 10 Modryn Oreyn has assigned me another of my duties. I am to travel to Leyawiin and find out why three members of the Fighters Guild--Dubok gro-Shagk, Rellian, and Vantus Prelius--have been causing trouble. 20 I have been told that I can find the three Fighters Guild members in the Five Claws Lodge, likely causing trouble. They warn me that it will be difficult to subdue the three men. 30 I've found the three Fighters Guild members, arguing loudly in the Five Claws Lodge. I will need to subdue them, either by knocking them unconscious or using a spell. 40 I've managed to subdue the three Fighters Guild members. I should find out why they have been causing so much trouble. 50 The men tell me that the reason they've been spending time in the tavern is sheer boredom. The Blackwood Company has been stealing all the Fighters Guild work in the area. 55 I've agreed to find work for my three guildmates here in Leyawiin. Perhaps some of the locals know of some. 60 I've heard a rumor that Margarte, who lives in Leyawiin, may have jobs for the Fighters Guild. 70 Margarte has told me that she would pay well for minotaur horns or ogre teeth. However, she doesn't trust the Guild yet. I'll need to bring her five portions of ectoplasm, and she'll give us her business. 75 I've brough Margarte the ectoplasm she requested. She'll now pay Fighters Guild members for minotaur horns and ogre teeth. I should tell the men back at the Five Claws. 80 I've told Dubok, Rellian, and Vantus about Margarte's need for ingredients. They've agreed to accept the long-term contract. As this should keep them out of trouble, I should report back to Oreyn. 100 Finishes quest Oreyn was pleased with my efforts, though troubled that the Blackwood Company is stealing Fighters Guild contracts. It is possible to use the console to advance through the quest by entering setstage FGD02DandD stage, where stage is the number of the stage you wish to complete. It is not possible to un-complete (i.e. go back) quest stages. See SetStage for more information. This page was last modified on 20 October 2017, at 22:09.